As pet owners, we understand that we will likely outlive the lives of our pets. What we don’t know is how they will die and what decisions we will face as they enter the end of their journey. In some cases, we will be faced with very difficult decisions as we receive the news that our pet has a terminal illness. Perhaps this will mean that no further treatment is recommended but with advances in veterinary care, we will often be given options that could extend our pets lives with some quality of life. 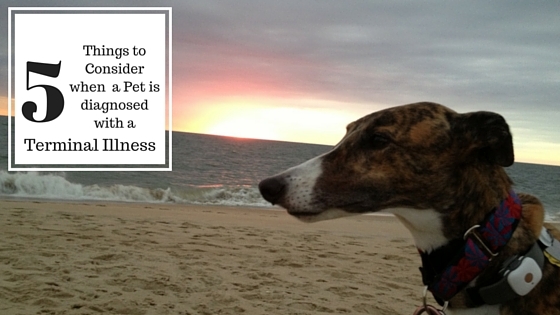 I was recently faced with this situation when my 7-year-old greyhound was diagnosed with osteosarcoma, bone cancer. As I reflect back on our journey through this disease, I wish there were things I had known prior to taking the journey. The following are five important things to consider when facing a terminal illness in your pet. Location of the tumor. Tucker’s tumor was in his rear leg close to the ankle. This was not a usual location for this disease. I convinced myself this was a good thing. I had also read that the further the tumor was from the lungs, the better the prognosis. Only if the tumor had been on his toes could the tumor had been further away. I also felt that I had caught the tumor early. There was no swelling and in fact, Tucker was barely limping. In general, it is the spread of cancer to the lungs that makes osteosarcoma a terminal illness but Tucker’s chest x-rays were clear. No sign of metastasis. In addition, I felt a rear leg amputation would be easier than a front leg. There are varying thoughts on whether this is true. Tucker’s personality. 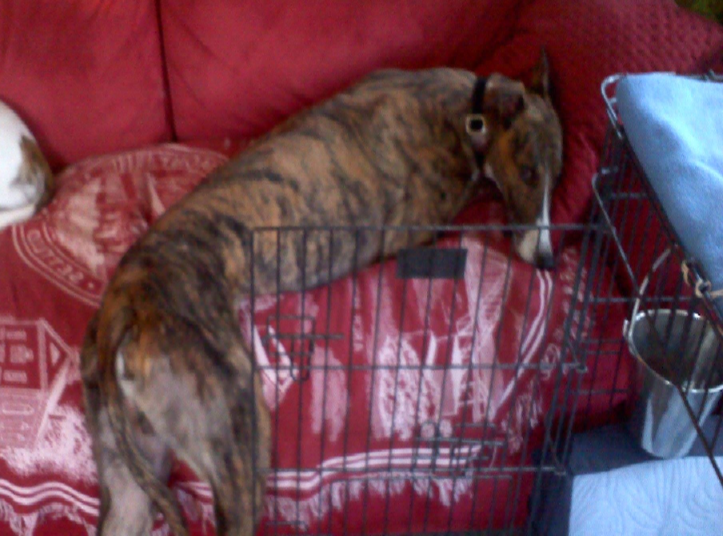 Tucker was the most uncoordinated dog I have ever met and certainly didn’t live up to the image of a “graceful” greyhound. I often joked that Tucker had absolutely no awareness of all his body parts. This picture, albeit a bit blurry, shows Tucker the first week he lived with me “thinking” he was laying on the couch, completely unaware half of his body with still on the floor. So when I decided to move ahead with the amputation, I joked that he would likely do better with one less leg to worry about and in fact, he actually did do stairs better on three legs. Tucker was full of life and curious about everything around him. He would plow into a crowd, dive into people’s purses and bags and be the first to greet new people. A trip to the vets was an opportunity for him to explore new areas and meet new people. Tucker’s general health. Aside from cancer, Tucker was very healthy. He was strong. I had seen dogs post amputation of a rear leg and I felt Tucker could handle it. He had a crazy appetite and never missed a meal so I wasn’t worried about him not eating during the treatments. Later I learned that having a good appetite prior to treatments was not always an indicator it would remain the same. He was also young. How could you not give a 7-year-old an opportunity to have more life? I felt justified in my decision but this was a double edged sword as it appears the younger the dog at diagnosis, the more aggressive the disease. Understand the costs. We are lucky that we live in an era where our pets can receive almost the same level of medical care as humans. While this is great news, it also comes at quite a cost. 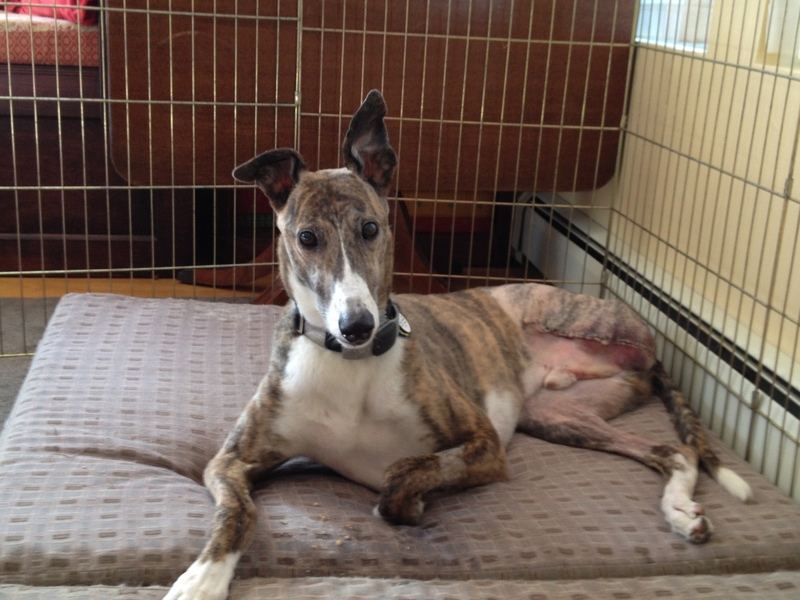 When I adopted my first greyhound, I knew I never wanted to be faced with having to make a decision about my pet’s care based on how much money I had in the bank so I have always carried health insurance on my pets. To date, no insurance company has ever made any money off me and there are days, I actually wish they would because it would mean I had a healthy pup. If you don’t carry insurance, I recommend you check out www.petinsurancereview.com. If you do have a policy or are going to purchase a policy, make sure you know what it covers. While I knew the amputation would run into the thousands of dollars, I didn’t understand the cost of all the follow-up care. For some reason, I felt uncomfortable discussing it with his oncologist and even still, it was unclear as it was not known what path his cancer would take. Below is a general recap of the cost of Tucker’s care during his 10-month journey. Bone Biopsy – $1,200. Due to the location of the tumor, we decided to do a biopsy as it could have been an infection or cancer that did not require amputation. Chemo Treatments – $3,000. I was actually able to secure free chemo for Tucker’s first three chemo treatments but you still need to pay the office visit and administration costs. The biopsy of Tucker’s leg initially showed no lymph node involvement but after closer examination, they found cancer in his lymph nodes at a microscopic level. After the first three treatments (8 weeks post amp) we did a chest x-ray and found a lung tumor so we switched chemo drugs for another three treatments. X-rays, blood work, and regular check-ups – $3,500. This was over the course of his 10-month journey. He had x-rays every 6 to 8 weeks where he would need to be sedated given his size and general stubbornness about cooperating. Chemo was every three weeks and then we moved to visiting the vet once a month for lab work and general check ups. Medications – $4,000. This is where knowing your insurance policy became important to me. I had decided not to include the rider for prescription coverage. After we switched chemo drugs and did another three rounds, we found a second tumor on his lung. Our last option was to try a new at home drug called Palladia which was recently approved by the FDA. While not generally used for osteosarcoma, they were beginning to see some results for dogs who had lung metastasis such as Tucker. Pfizer is the only company that manufactures this drug and word on the street is they are losing money on this drug so the cost is high. Given Tucker was a large dog, he needed a large dose and this drug alone cost $500/month and he was on it for 6 months but it did stabilize the tumors. I had no idea drugs could be this expensive. CT Scan & Radiation – $3,700. When we made the change to Palladia, Tucker began experiencing jaw pain. While there was some thought that it could be cancer had spread to the jaw, it seemed very unlikely so we started giving him a NSAID every other day and the pain went away. Tucker had a great 4-5 months on Palladia. Only later did we learn, the pain was, in fact, being caused by a new tumor in his jaw so we discussed the option of radiation providing some pain relief for a few months. I really struggled with this decision the most. Cancer in three known parts of his body. We weren’t winning this battle and he was beginning to become extremely fearful of car rides and vet visits. But then I saw this, as seen in the video below. This is Tucker the day before his radiation began. This just did not look like a dog who was ready to give up. Final cost – $18,100. I was lucky to have had insurance. I was lucky his policy renewed midway through his illness as his policy only covered $10,000 annually ($50,000 for a lifetime) of an illness. I was lucky I had a $300 annual deductible and a 10% copay. For things not covered by insurance, I charged them to my Care Credit card which offers promotional time periods to repay balances interest-free. Tucker had three weeks following the radiation but we could not control the pain. When he would no longer eat, I was no longer able to administer the pain medication that would provide relief and quality of life. Exactly 10 months post amputation, Tucker lay peacefully in the sunshine of my backyard, his kingdom, and his journey ended. Think about your family, including other pets in your household. A terminal illness will upset your world and routine. Your priorities will shift and your emotional state will be fragile. There is no way that this will not impact others in your household. 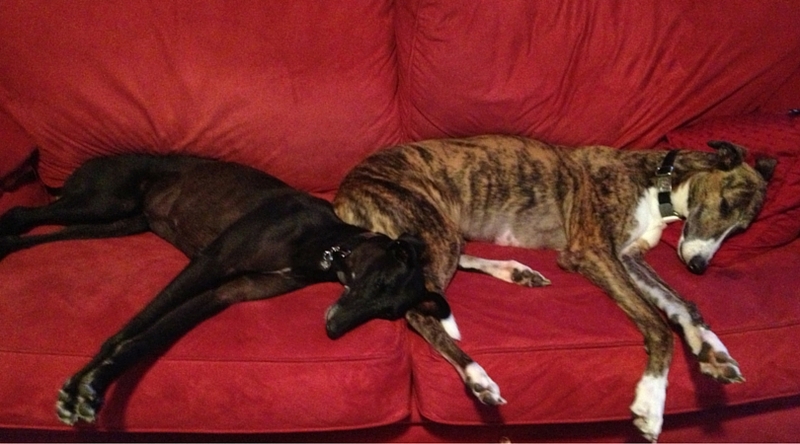 I have two other greyhounds. Thunder, a nine-year-old who had been with me for five years and Tica, who had joined my pack just a year earlier. Tica was from Spain where she had a tough life and had several emotional scars. The year previous had been all about helping Tica adjust to a very new life. Tica & Tucker had a love-hate relationship. I think she was madly in love with him and was your typical bratty little sister who couldn’t care less that Tucker had hundreds of stitches or wasn’t feeling well. As the attention shifted from her to Tucker, she became my biggest challenge as she just wouldn’t leave him or me alone. I couldn’t figure out if she was bothering him or amusing him. She was constantly under foot as I tried to assist him with adjusting to life on three legs. She was at her worst during the days Tucker didn’t feel like eating. Tica’s past life clearly involved long periods of time without food. Her drive for food is over the top and it’s hard to calm her down when there is food around. I remember one night sitting on the floor in the family room with an entire rotisserie chicken in my lap, tearing off pieces and hand feeding them to Tucker with one hand and using the other hand to fight off Tica. I finally resorted to setting up an x-pen around Tucker, myself and the chicken to keep Tica away. Her reaction was to scream non-stop, bringing my blood pressure to its boiling point and stressing Tucker out to the point where he refused to eat. This is just one example of many where life just couldn’t be understood by all involved and I felt like crawling under a rock to hide from what my life had become. Understand your limits. Many will not understand your decision to move ahead and some might think such horrific efforts to keep a dog alive are unnecessary and ridiculous. How could you possibly consider removing a dog’s leg? How could this possibly be a good use of money? You are only thinking of yourself and not your dog…..and so on. I estimate that probably only 10% of my friends and family agreed with my decision. Of the 90% who didn’t 40% probably supported it anyway. While they wouldn’t make the choice themselves, they didn’t have an issue with my choice. The remaining 50% disagreed completely and some, but not all, kept their opinions to themselves. You need a thick skin to get through this. The reality is no one is wearing your shoes. No one knows your dog and your relationship with your dog like you do. No one’s opinion really matters except your own. I did find, however, this put me in a very lonely place. I was overwhelmed with the constant care, worry, and decisions that I had to make on a regular basis. I truly felt I was in this alone but I thought I could handle it. Until the end. As I began to sense Tucker was beginning to experience more pain and less energy, I became obsessed with needing to know how he was going to die. In fact, I knew how he was going to die. I was going to make the decision but what would be the indicators that would allow me to find some peace. I so feared living the rest of my life with regret because I made a bad decision. Seems silly now. There are no bad decisions when you are losing a pet and there will always be some regret. The end result is all the same. I remember discussing this with one of Tucker’s vets and she was brutally honest. She told me it was going to be hard and I needed to think about MY limits. At first, I was insulted. This wasn’t about me, it was about Tucker’s limits. But was it really? Tucker was going to die. I could have chosen to let him die months earlier and it would not have been a wrong decision. I am the one making decisions for him and I will need to live with my decisions for the rest of my life. Nothing I can do will keep him alive forever. I now believe what she was saying was that I needed to find my own peace and understand that it would not come without pain. The pain of loss is unavoidable. Are you facing a terminal illness with your pet? Check out our blog “Focusing on the End instead of Living the Now”.